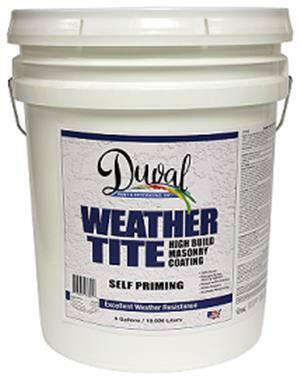 Duval Weather Tite Waterproofing Sealer-Duval Paint & Decorating, Inc. Specially formulated waterborne epoxy-ester sealer/surfacer specifically designed for application directly to porous and some non-porous concrete substrates, such as garage and carport floors. It is designed to penetrate, reinforce, and provide a more compatible surface for the application of various types of floor and architectural coatings without the need to acid wash the surface. Easy to apply, its special formulation promotes superior adhesion properties, dries fast, excellent product versatility for application to various other surface types, and cleans up with warm soap and water. Great for interior & exterior use.